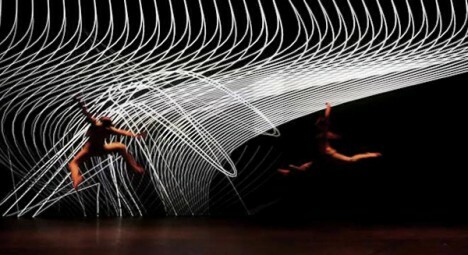 Combining choreographed movement and projected abstractions, these works of performed art are visually stunning, creating effects and illusions far beyond the sum of their parts. 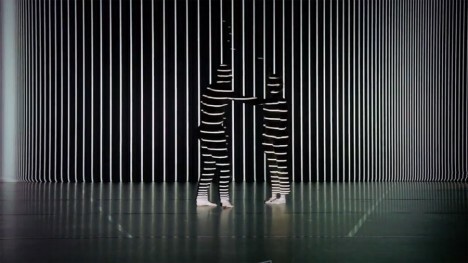 The idea of projecting onto moving performers is, however, not new – indeed, Klaus Obermaier has been using low-tech projectors and equipment to create equally amazing work for decades. Indeed, while speaking at INST-INT recently in Minneapolis, he joked that he would carry on using his decade-old laptop until it broke down. Indeed, the lower-tech approach he takes relies heavily on the ability of each dancer to have complete control of their own movements, making their skill a critical part of each and every exhausting performance. Obermaier has also engaged in other forms of public interactive projection art over the years, taking his productions off the stage and allowing passers by to interact with his work.